The latest first-time broodmare being bred in a Housatonic Recommended Mating is Animal Kingdom’s daughter Animalistic, who heads to WynOaks Farm for a date with their thoroughly-proven stalwart Weigelia. The definition of “blue collar,” Weigelia won 13 of 48 starts from 2- through 7-years-old, including the Grade 3 Kenny Noe Jr. Handicap and the Grade 3 Carry Back Stakes plus an additional half-dozen dirt stakes races — not to mention setting new course records on the turf at both Belmont and Monmouth — and he placed in 20 more races. Then at stud, despite being the only stakes winner by a stallion who never achieved black-type, Weigelia has sired 6.2% stakes winners from his 113 foals aged 3 and up. His starters have earned an average of more than $81,000, and his 1.48 AEI compared to a 1.01 CI demonstrates that he is moving his mares way up. He also had a bit of a commercial coming-out party with his sales yearlings in 2018, as six of them averaged over $18,000 off of his $3,500 advertised stud fee. Going to a proven stallion is the best way to get a handle on a young broodmare’s ability as a producer, and in addition to his over-all success, Weigelia makes sense for Animalistic on pedigree, as well. The nick is good for an “A” (for foals by Danzig-line sires out of mares Candy Stripes and his line) on the strength of a trio of Argentinian Group 1 winners. This South American bent is not surprising, given that Animal Kingdom is a son of the Brazilian-bred Leroidesanimaux, he in turn a son of Candy Stripes, who was a leading Argentinian stallion (also responsible for North American Horse of the Year Invasor, and the broodmare sire of Candy Ride) — not a sire-line that is very well-represented in the U.S. these days. But Candy Stripes is a son of Blushing Groom, and Weigelia actually has six foals from mares by Blushing Groom-line stallions, of which five have raced and four have won, with average earnings per starter of more than $110,000. 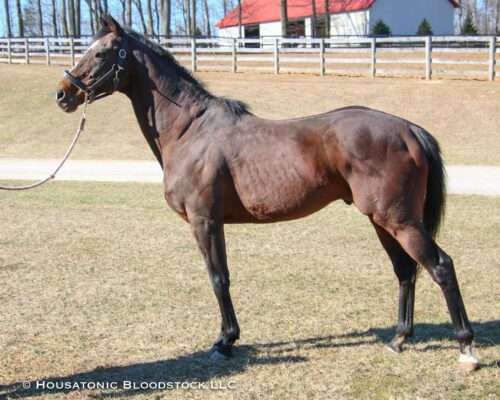 Animalistic’s female family has also produced some good horses by Danzig-line stallions like Weigelia, with Grade 1 winner and champion 2-year-old filly Victory To Victory (sired by Danzig’s son Exchange Rate) the best of them. A further recommendation for this mating is the versatility present on both sides: Animal Kingdom was renowned for his versatility, having taken the Kentucky Derby-G1 on dirt, the Dubai World Cup-G1 on synthetic, plus having been 2nd in a pair of turf Grade 1s as well; while Animalistic’s dam Misty Sixes was a stakes winner on both dirt and turf, and her second dam was a Grade 3 winner on dirt but has also produced the turf stakes winner Broadway View. This should compliment Weigelia’s multi-surface ability perfectly, and give the foal from this mating plenty of options on the track.